in the Age of Monetary Exchange. & as I near the door, you leave. july 10, 2000. The folks at the San Francisco Planning and Urban Research Association may be mulling over the old admonition, "Be careful what you wish for, because you might get it." San Francisco’s self-styled "preeminent public policy think tank" has devoted more than 40 years to the cause of restoring economic vitality to the downtown area. Its success today must far surpass any glimmering expectations that accompanied its founding. We can say without hesitation that downtown San Francisco is thriving. It is also literally booming, as the din of construction competes with the roar of bumper-to-bumper cars, buses, and trucks. 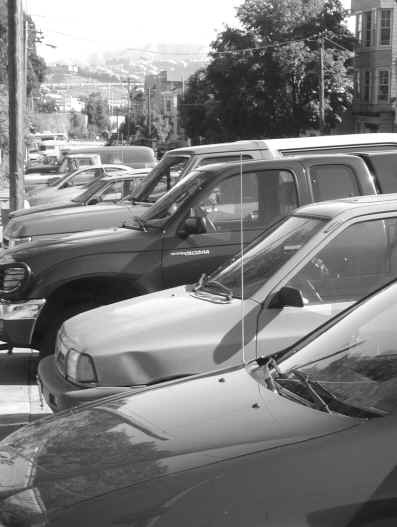 Every morning a monster gridlock grabs hold of SOMA streets as thousands of cars from other parts of the Bay Area funnel off the freeways and thousands of cars from other parts of the city pour into the area. Every evening the direction of the process reverses, but the effect is the same. The sidewalks become decidedly pedestrian-unfriendly, as fumes clog the air. And only the young and foolish would brave the streets on a bicycle. As SPUR knows all too well, the sights and sounds of SOMA are only harbingers for what will happen to much of the rest of the city within a few years. In 1959 one of SPUR’s missions consisted of a massive effort to create support for the redevelopment plans it proposed. Today the educational mission remains, but its focus has changed. Today, as a way of undoing some of the damage of redevelopment run rampant, SPUR has become a most welcome proponent of revitalizing San Francisco’s transit-first policy. During the past year the organization has released a series of studies, interviews, and other communications that create a hardheaded twenty-first century framework for this policy. The issue is complex; its solutions are manifold and occasionally controversial. While some may disagree with the pro-dot.com assessment that "attempts to freeze San Francisco in some romanticized blue collar past will inevitably fail," the stated assumption underlying the transit-first push is hard to fault: "San Francisco is the densest American city outside of Manhattan. With our compact downtown, limited area, hilly topography, and strong legacy of transit service, our whole development pattern depends on effective transit. Streets are narrow, much of the city was built before the automobile, and we are all pedestrians at some point during the day." Public transit was on the spot long before the automobile, notes SPUR president Jim Chappell, beginning with a horse-drawn stagecoach that carried Gold Rush settlers from Mission Dolores to the burgeoning village of Yerba Buena. Fifty years later, a thousand transit vehicles served a population of 350,000. By 1920, the city’s half-million people were committed to their buses and trolleys: they tallied 330 million annual transit boardings, a figure 50 percent greater than the yearly rate for today’s 750,000 people. What happened? The post–World War II period saw the spread of suburbia. The hollowing out of U.S. cities spawned a strong car culture and snubbed out urban and inter-urban rail lines all over the country. Now, SPUR argues, it’s time to reverse the process. It’s actually time long overdue, according to many environmentalists and traffic engineers — and also according to SPUR. This seems to be one of those cases when conditions had to deteriorate disastrously before people were willing to get off their duffs and actually do something about it. The plan is simple: give private cars the lowest priority on the transit list. In fact, do away with the list altogether and rank every other form of transportation equally above private cars. The bad example of SOMA has brought home an old urban planning truth: start with transportation routes and build out from them, not the reverse. The tenacity of the automobile-driven system points to the need for careful counter-planning by the newly created Municipal Transportation Agency. The people at SPUR never come out and say that the present mess stems from shrewd strategy on the part of the automobile and gasoline industries, but at the very least they suggest that the car guys were happy to leap into a planning vacuum. Everything flows from these premises: Ensure regional cooperation by obtaining funding for joint transit development. Discourage regional expansion of the freeway system, which would direct more traffic into San Francisco. Discourage the building of additional parking spaces, in accord with Field of Dreams principles. Make Muni really work by expanding and rationalizing service to all parts of the city. Encourage walking with wide sidewalks and traffic calming. Integrate bicycles completely into the transit network. Etc. Etc. Etc. We’ve heard all these proposals before, either separately or en masse. But there’s one more, which seldom receives serious attention: car sharing. The city’s mandate is in place. An organization called City CarShareis actively soliciting funds and scouting for vehicles. Imagine a club where you pay, say, a $300 damage deposit to join and, say, $15 a month. When you call to use a car, you’ll be directed to the nearest available one, which you’ll start with your personal key card. Do your errands and return the car. At the end of the month, you’ll be billed, say, 25 cents a mile including gas and $1.50 an hour. Now sit down and figure out how much you spend to use your present car, including gasoline, parking, insurance, and maintenance. Now lock your garage and throw away the keys.